At Qualtrics, we love surveys. Naturally, we like to create our own from time to time to showcase the sophisticated, unique and innovative features of Qualtrics Research Core. A common question we receive from our clients is how to make surveys more engaging in order to drive up response levels. To answer this call the Qualtrics Marketing team recently developed a clever survey entitled, “How Long Could You Survive the Zombie Apocalypse?” using more than 10 different question types. The team embedded it on the Qualtrics Facebook page and sent it out via Twitter and LinkedIn. Within days, the survey went viral, capturing 250,000 survey responses in the first few days. Soon the survey began averaging 8,000 responses an hour and reached 1.7 million responses in two weeks! Clearly demonstrating the power and scalability of the Qualtrics enterprise survey platform and its ability to deliver real-time insights. In fact, the viral nature of the survey attracted media attention and, as a result, Mashable wrote an exclusive piece and developed an infographic to showcase some of the fascinating results. The infographic highlighted the most popular zombie-fighting tools, the average length of time that folks would survive a zombie apocalypse based on age group, and which gender would fare better in the make-believe mayhem. Make it relevant: In case you haven’t heard,Zombies have experienced a major resurgence in pop culture, fueled in part by the hit AMC series “The Walking Dead,” the most-watched drama series in basic cable history. To take advantage of some of this love for the undead, we targeted a survey about surviving a zombie apocalypse to a relevant and ready audience. To create your own viral survey, do a little research, figure out what’s trending, then go for it! Timing is everything: We launched the zombie survey before the mid-season premiere of “The Walking Dead,” which attracted nearly 20 million viewers. The premiere was the #1 show of the night on Twitter across all cable and broadcast networks with 1.24 million show-related tweets. The show’s huge popularity and a broader pop culture fascination with zombies played an important role in the success of the survey. Luck is fickle, but timing is everything. Looks matter: A visually appealing survey will capture the interest of your audience and increase your response rates. The Zombie Apocalypse survey used more than 10 different questions types to make the survey easy and engaging for respondents, including skip logic, piped text, embedded images and a creative zombie background. Go mobile: Mobile research is a growing trend and this survey was no exception.A whopping 40% of respondents took the zombie survey using a mobile device. To make sure the survey looked great and functioned well on a desktop and across all mobile devices, the marketing team took advantage of the advanced device detection capabilities available in Qualtrics Mobile. Mobile compatibility features greatly increased response rates and served up a clean, consistent mobile survey experience for respondents. Make it convenient: Embedding your survey in your Facebook page, rather than posting a link, allows a respondent to take the survey without going to another site. Using a social media management tool like GroSocial, you can build a Facebook iFrame application and embed an internal web page in your custom Facebook page. By making your survey more convenient for Facebook users, it’s not unusual to see a 15-20% increase in your response rates. 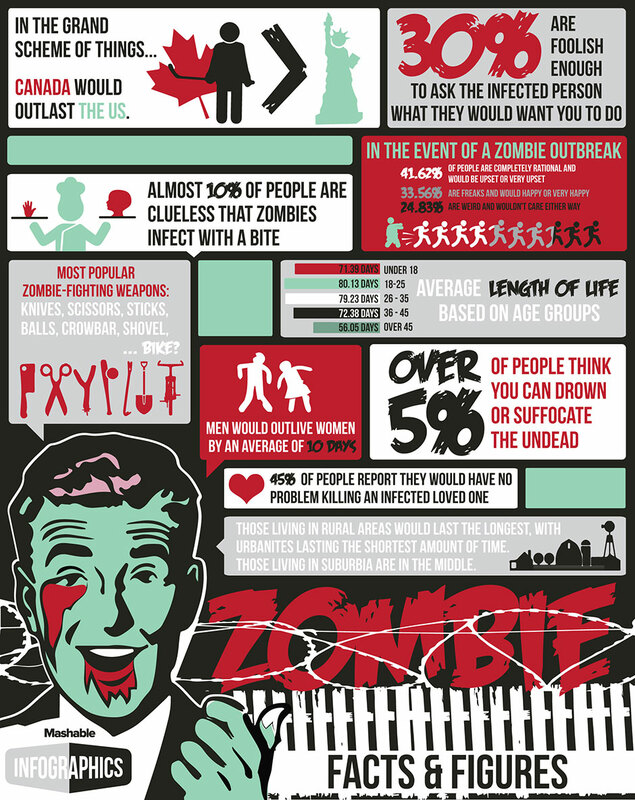 Let the games begin: The survey calculated how many days a respondent could survive a zombie apocalypse. This “scoring” component immediately inspired competition as respondents began eagerly comparing their scores to thousands of others. The survey also incorporated other gamification elements to capitalize on the naturally competitive nature of survey takers. Timed hot spots allowed respondents only ten seconds to select the best weapon, which could mean the difference between life and death in a real end-of-world scenario. Choosing the wrong weapon meant major point deductions and a greatly reduced survival span for respondents. Be social: Because the zombie survey included easy social sharing capabilities, it spread voraciously via Facebook and Twitter. Our end-of-survey message gave respondents the ability to share their results immediately on social media. Clicking on the Facebook, Twitter, and LinkedIn icons automatically populated a tweet or post with the individual’s score to send out with a single click. But to give the survey a little boost, we leveraged sponsored posts on Facebook. Twitter proved to be the platform of choice for respondents. In three and a half weeks, the survey garnered over 5,000 mentions and 2.2 million impressions on Twitter alone. With Qualtrics, there is no limit to your imagination to create surveys that capture the attention of just the right audience. Check out Qualtrics Support to get creative by expanding your use of the 100+ question types in Qualtrics Research Core. And to really prepare to survive a zombie apocalypse, get some good running shoes. There’s a reason zombies are called the “walking” dead.